Kuppam Engineering College (KEC) was inaugurated by the technology savvy Hon’ble Chief Minister of Andhra Pradesh Sri. N. Chandra Babu Naidu garu on 11-09-2001. The Institute was promoted by a well-Known Philanthropist Mr. B. C. Nagaraj, Founder Chairman of BCN Group of Institutions. KEC is accredited by NAAC, certified by ISO 9001:2008 and recognized by UGC under 2(F) & 12(B). 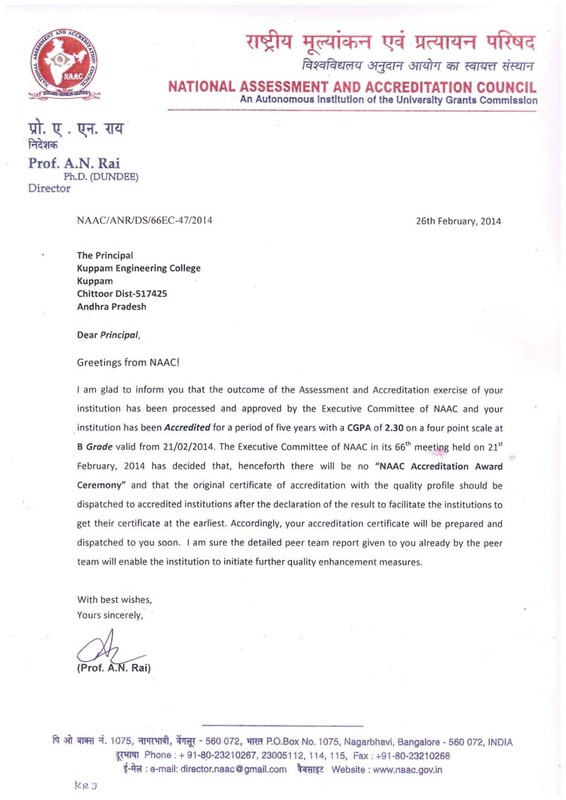 KEC is graded ‘A’ by the Government of Andhra Pradesh. Dr. N. Sunilraj, M.B.B.S., young and dynamic Vice-Chairman is working with an objective for phenomenal growth of the Institution and for its autonomous status in the near future. The Institute is headed by a dynamic Principal, Dr. S. Sudhakar Babu who has good academic and administrative experience. The Departments of EEE and ECE are recognized as approved research centres for Ph.D. programs by JNTUA, Ananthapuramu. KEC has well established laboratories, dedicated and devoted staff members in the various Departments of Engineering and Humanities and Sciences. The ambience in the Institute is good and encourages the Students to take part in Co-curricular and Extra curricular activities for an overall development of the students. In order to improve the employability of the students graduating, KEC imparts value added skills through Andhra Pradesh State Skill Development Corporation, ORACLE Academy, Microsoft, Texas Instruments, CISCO and Auto desk. The Andhra Pradesh State Skill Development Corporation in collaboration with SIEMENS has established a skill development centre to help the students attain skills apart from their curriculum for better employability prospects. Kuppam Educational Society in addition to Kuppam Engineering College also established Kuppam Public School, Kuppam Junior College, Kuppam Polytechnic, Kuppam Degree College, Kuppam Teacher Training Institute and Kuppam College of Nursing for educational development of the society in and around Kuppam. Sri. B.C.Nagaraj, Founder Chairman of KEC is recently awarded “Excellence in the filed of education in rural area” by Andhra Pradesh State Government. The award has been presented to him by the Chittoor District Collector Sri. P.S. Pradyumna IAS, on the 69th Republic Day Celebrations in Chittoor on 26-01-2018.